A big congrats to Ana and Chang on their beautiful wedding on the cliffs at the Kona Sheraton on the Big Island of Hawaii. Kahu Tom preformed the ceremony. 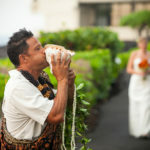 Tom chants the bride and groom in and also includes other Hawaiian elements into the ceremony. 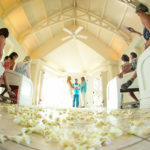 The Kona Sheraton is a great place to get married. They have a chapel, a wedding lawn, cliffs, and even a waterfall.